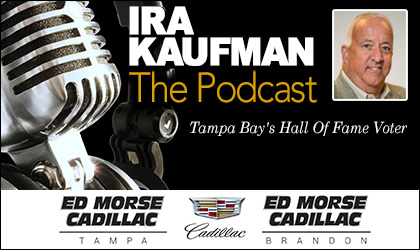 Congrats to The Ira Kaufman Podcast for entering its second year — YEAR! — on the Google Play podcast top charts, all genres nationwide. Stunning for a local podcast in an era where political discussion dominates. 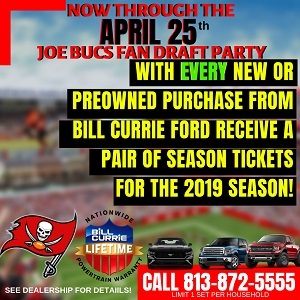 Today, the Sage of Tampa Bay sports joins Joe for the usual intense chatter about all things Bucs, presented by Ed Morse Cadillac Tampa and Ed Morse Cadillac Brandon. I want the best player to play regardless of draft status. As of now, Fitz has outplayed Jameis. I wish our QBs both well, but do not play the lesser performer. Bucs got Skins, Giants and Niners for the next 3 games. All very winnable. Washington will be tough. Grudens’s players buy into what he is selling. They will play hard come Sunday. Giants and niners though got nothin. If we cannot beat these 2…then Fire Koetter on the spot! Arians would be a great choice. But he may not want to come here. Dungy might make a great GM guys. I see us having 4 more Wins. Not enough to save Koetter and his staff. And Licht? Sorry, give him his walking papers too! @Joe … “It’s a veteran defense”. Seriously Joe? They’re playing a bunch of scrubs and newbies on defense, plus yes, a few veterans like GMC, JPP, LVD, Grimes (only JPP of whom is playing worth a hoot). This Secondary is typically playing 4 of 5 guys (when nickel’s in) who are rookies or 1st year players. What could possibly go wrong? Interesting observation in the podcast that Winston came back a different QB AFTER his suspension was finished (different from what we saw in the preseason). I wonder if there’s any validity to that. A group failure, sufferin succotash. Buc fans bewildered. I don’t understand the call for a ‘President of Football Operations’. If the logic is that a PoFO can pick a GM better than the Glazers, then it’s bad logic. It *assumes* that the Glazers are better at picking a PoFO than a GM. If that’s the case, they should pick a PoFO and then make him the GM.The only thing a PoFO does, is add a layer of bureaucracy. For teams like the Cowboys, where the owner is extremely meddlesome, the extra layer might be good, but the Glazers have been one of the more ‘hands-off’ owners in the league. If I am missing another advantage, let me know. Ya, great idea to get rid of the GM. We only have one of the top offenses in the NFL, regardless of who is the QB. Ya, so let’s fire the guy who put it together ! I think the idea of hiring a PoFo here has less to do with adding bureaucracy and more to do with adding some universal respect to the decision making process in the front office. The Bucs are in a catch-22 where they need a real NFL coach that has the chops to change the culture but none of them will come and answer directly to the Glazer brothers. So, we get stuck with the castoffs (Koetter/smith), guys who were generally low on the wish list of sought after coaches (schiano), coaches who are stuck in the last generation and have been out of football (lovie) and the in-house guys that would be yes men (raheem/Koetter). The Glazers might be hands-off and open their checkbooks more than their dad, but their decision making is absolutely atrocious and it has led to a near decade revolving door of 2-3 year coaching staffs. No coach with the pedigree needed to change the culture would willingly come up under their thumb and that’s why we need a John Elway type front office figure to be a true guiding hand and lure a real NFL coaching staff to fix the Bucs. Why did you guys stop posting the podcast on Google play? The last one up is from October 18th.